The Libertas Americana medal that inspired the 1793 half cent was designed by French medalist Augustin Dupre as a celebration of American victories in the Revolutionary War. Intricately detailed and highly expressive, the medal made an excellent model for a coin. But the original adaptation of the design lasted only one year. In 1794 Chief Engraver Robert Scot modified the design by enlarging the bust of Liberty and having her face right rather than left. He also greatly increased the size of the “mob” cap set on top of the Liberty pole. An innovative mechanical experiment was tried with the reverse. Rather than using individual device punches to make up the die, Scot created a complete reverse hub that included the wreath, all lettering, and denticles around the border. The wreath was similar to the one from the previous year but without the sprays of berries. The entire design was sunk in higher relief than the half cents of subsequent years. Actually, the half cents of 1794 represent a distinct type, quite different from the half cents of 1795-97, but traditionally included with the later years. The dies for the half cents of 1795 through 1797 were cut by Assistant Engraver John Smith Gardener, who lowered the relief, reduced the size of Liberty and hand-punched in the wreath. While the series has only two major design types, it includes numerous varieties, including the so-called “punctuated” date of 1795, created by a slip of an engraver’s tool, which resulted in the date reading 1,795. Varieties with the pole missing in front of the bust of Liberty exist for both 1795 and 1796. In both cases an unintentional flaw, but caused in 1795 by excessive lapping of the die, while the following year the die sinker apparently forgot to punch in the device. Some half cents from 1795 and 1797 were struck from cut down Talbot, Allum & Lee tokens, necessitated by the Philadelphia Mint’s frequent shortages of copper planchet stock during the 1790s. Occasionally remnants of the host token can be seen with traces of the ship’s sails or the peripheral lettering apparent on the finished half cent. Liberty Cap half cents possess undeniable appeal for both novice and advanced numismatists, and enjoy strong demand from date, die variety and type collectors. Although half cents have always seemed to have second class status in relation to large cents—both as a circulating medium and among collectors—die variety collecting of this denomination has gained many new adherents as more research is published. Cohen’s 1982 American Half Cents and Breen’s 1983 Encyclopedia of United States Half Cents have added much to the body of information available today. 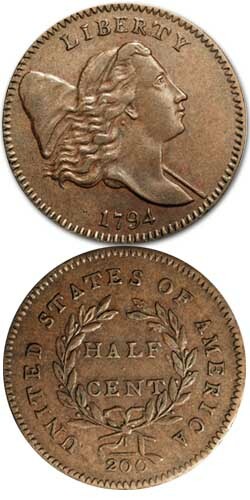 The Liberty Cap half cent was last struck in 1797, when production of the denomination was suspended. The half cent would not appear again until 1800, this time with Scot’s adaptation of Gilbert Stuart’s Draped Bust design.